Brad Schmett and Jacqulyn Stanton of Brad Schmett Real Estate Group announced today that they are challenging Girl Scouts in the Palm Springs area to participate in the Cookie Pitch Challenge. Brad Schmett Real Estate Group will purchase $100 worth of Girl Scout Cookies from the scout who presents the best “Shark Tank” style sales pitch. Brad Schmett and Jacqulyn Stanton of Brad Schmett Real Estate Group are challenging the Girl Scouts to impress them with their best cookie sales pitch. President and CEO of Brad Schmett Real Estate Group, Brad Schmett, is exclusively endorsed by Barbara Corcoran, the star of the hit TV show “Shark Tank”. While Schmett was trying to think of a way to spread the entrepreneurial spirit among today’s youth, the idea for the Cookie Pitch Challenge was born. 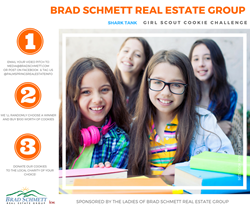 Brad Schmett Real Estate Group will purchase $100 worth of Girl Scout Cookies from the hard-working scout who creates the best “Shark Tank” style sales pitch. The winner will then be able to donate the cookies to any charity of her choice. Local Girl Scouts in the Palm Springs area are invited to record a concise, sales pitch video that highlights the following topics: Why it is important to be involved in the community. My plans for utilizing the money earned in cookie sales. Why I chose this specific charity to donate the cookies to. Parents can help their Girl Scout enter the Cookie Pitch Challenge by uploading her sales pitch video to Facebook and tagging Brad Schmett Real Estate Group, or by emailing the video to Media(at)BradSchmett.com. Entries must be submitted by midnight on February 12th. The winner will be contacted via email and announced on Valentine’s Day. Find out more about the Cookie Pitch Challenge on Facebook. Brad Schmett Real Estate Group and Keller Williams Realty – Palm Springs, is an exclusive, elite and sophisticated group of real estate consultants raising the bar for service in the greater Palm Springs area real estate market.